Least Flycatcher ID…not so straightforward? This fall, I have embarked on a migration monitoring project in the west end of Ottawa. I visit NCC Shirleys Bay Waterfront Trail several times per week. I have enjoyed seeing “fresh batch” migrant arrivals, increasing and decreasing species abundance; changes to species richness; influxes of specific age groups, etc. Midway through this week, I noted an influx of first-year Least Flycatchers. Ratty-looking adult Least Flycatchers are on the move south as early as the third week of July, entirely petering out by late August. Juveniles peak a month later (amazing, eh? ), peaking from late August until the end of the first week of September (Hussell, 1981). Juvenile Least Flycatchers are quite bright grayish-green throughout the upperparts, and in some examples, the underparts are lightly “vested” with dusky tones. The throat may appear entirely dusky from certain angles. 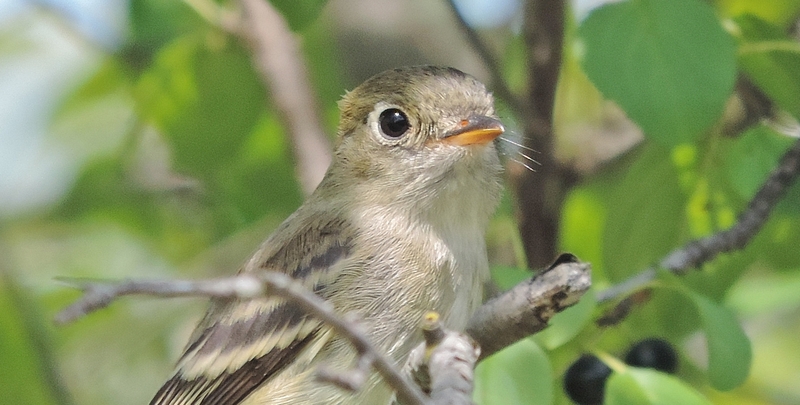 Some birds may not be safely separated from Yellow-bellied Flycatchers in the field (Kaufman, 1990). Most of the birds (~80%) I have encountered are giving a light “whit” call, similar to Willow Fly, but less emphatic and lower in pitch. Note: at this time of year, I would caution against identifying a flycatcher to species based off a “whit” note. Figure 1: Dusky “vest” and lightly-marked throat (appears dark at certain angles. Figure 2: Same bird — different lighting. When shadowed, the dusky vest and light dusky wash to the throat are quite pronounced. Figure 3: In good lighting, an immaculate first year Least is such a beautiful study. Note the broad buffy wing bars, dusky “vest”, and whitish throat w/ a light suffusion of dusky tones. In this shot, its rictal bristles show through quite nicely. As always, with Least: large head; pale throat contrasting with underparts; significant, bright eyering; proportionally small, balanced bill (not esp. broad-based…like Yellow-bellied); orange lower mandible with dusky tip; short primary projection; short and thin tail. Hussel, D.J.T. 1981. Migrations of the Least Flycatcher in southern Ontario. 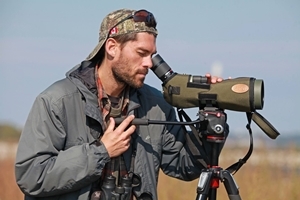 Journal of Field Ornithology 52: 97-111. Kaufman, K. 1990. Advanced Birding. Houghton Mifflin Co., Boston, MA.